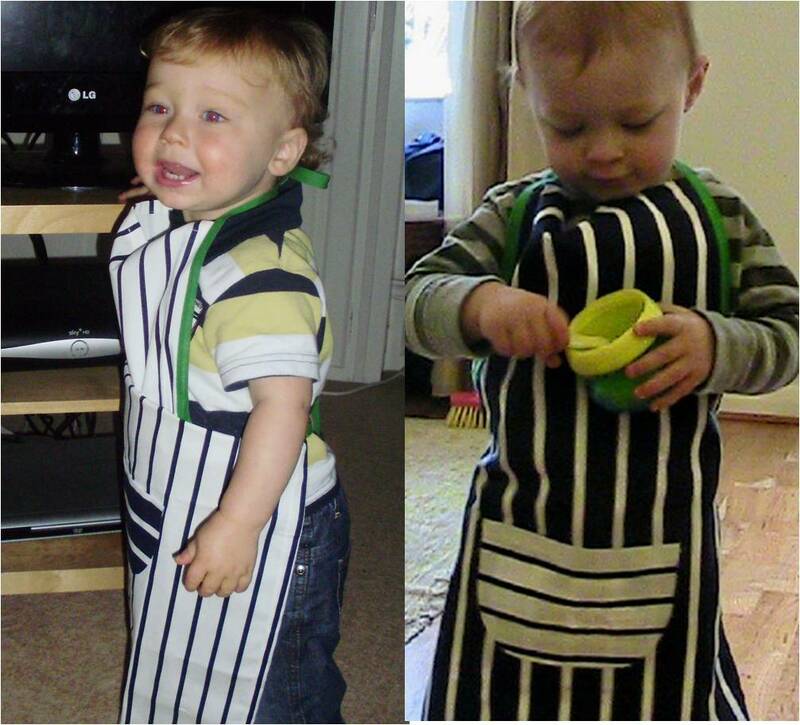 AMENDMENT – I made this apron “NO SEW”… I now think it is better to sew this… after say 15 washes the bonda web frays. I have been looking for an apron for Red Ted to colour in himself for ages now. All the plain aprons cost a small fortune (£6+ postage), which for a child to colour in and then cook with seemed a little much! So, I decided to take me lovely “No Sew” technique and give it a whirl. I used the remains of some old white fabric I have (I think it used to be a thick sheet?) and some amazingly lovely ginham bias binding, that I found on ebay! And my old friend “WonderWeb” – wonderweb traditionally is used for hemming skirts or trousers with an iron, but give it to me and we can make much lovelier things! 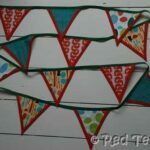 The technique is the same as for the No Sew Bunting and No Sew Bib. So please do check the No Sew Bunting tutorial for “gritty” detail, I have almost assumed that you know “the basics” of WonderWeb and no sew. 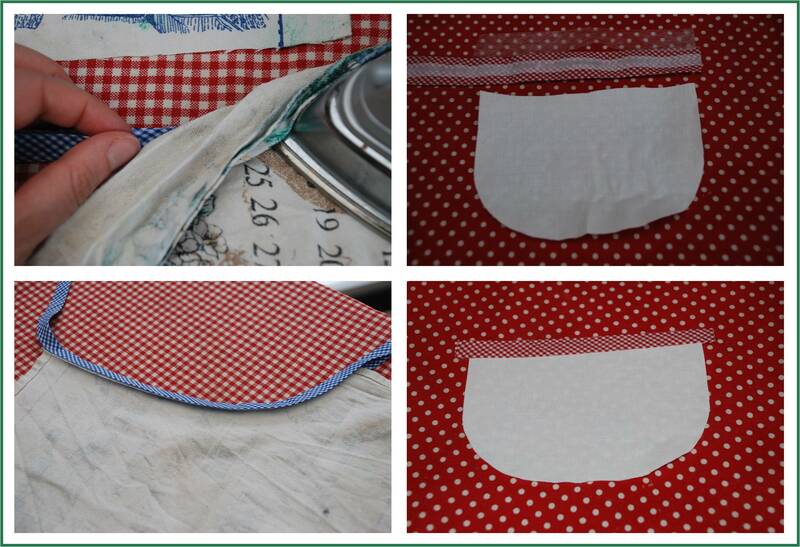 Follow the No Sew Bunting instructions to do a couple of test strips until you feel comfortable to tackle the apron! The number one key thing, is to iron your wonderweb really hot and several times so that it fuses really well. 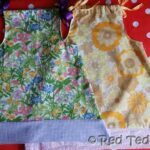 Once I had finished my apron, I realised, that it was the same size as a tea towel – which means a) you can make it even easier and simpler (as you can use the already hemmed edges) and b) you can recycle and old tea towel or buy a cheap set of tea towels to use! 1) Materials: Cotton Tea towel or fabric (it must NOT be toweling of any sort, as the wonderweb won’t grip), approx 1.25m of wonderweb and 1.25m of bias binding – double that if you want to “hem” all sides. Iron, ironing board, two tea towels to “iron between” and protect iron and ironing board from sticky wonderweb! 2) Fold teatowel in half and mark out a section for the top of the apron. Cut. Keep these pieces as you can use them for a little pocket. 4) It is useful to “pre iron the binding” as it is less fiddly, so fold it in half and iron a nice crease, this will make it easier next. 6) Aline bias binding with some wonderweb “in it” to the Tea towel. Bias binding is wonderfully flexible and you should be able to get a nice curve. 7) Iron in place. Check you have it right and then give it another hot iron. 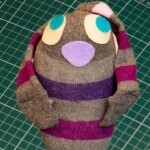 8) Add wonderweb for the waist tie and fuse with iron. 9) Repeat for other side. 10) To make a pocket: cut a pocket shape, add bias binding if you wish. Then place in position (just below the waistline, I did it a little too low on the Red & White one) and place some folded in hald WonderWeb all around the edge. Iron in place. 11) Turn apron round and iron all over again. N ice and hot! I am going to get Red Ted to decorate his one day soon! I invited some friends round to have a go at the apron and this is the too cute result! 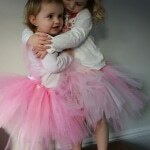 you find your little ones are too little for a full length teatowl. just trim the bottom off and add a line of bias binding/ Wonderweb, it will look just as pretty! We had two contrasting tea towels (bought for £1 each!) 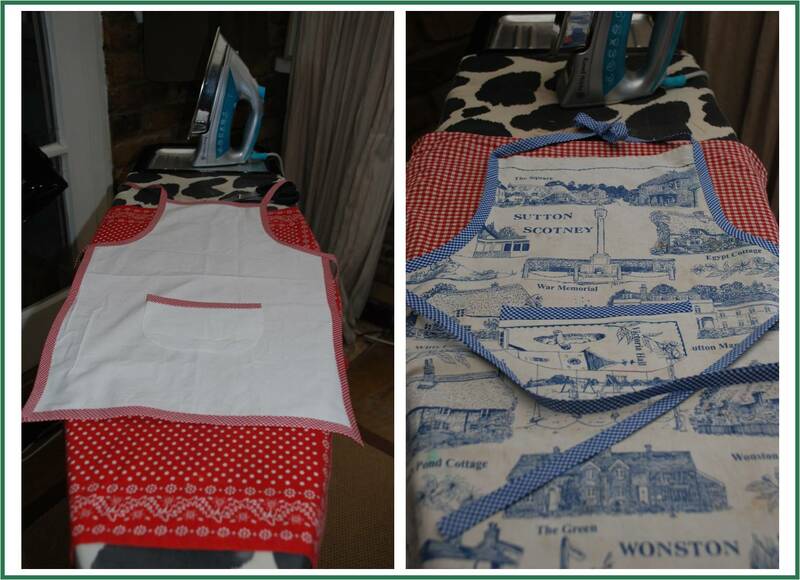 and made two aprons – using the cut offs as contrasting pockets. Plenty of roomto grow into! 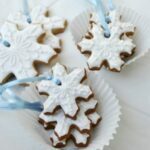 How to… Make Royal Icing Iced Biscuits – Ideal for Christmas! 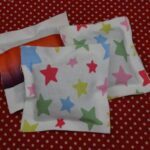 How to… make No Sew Lavender Bags/ Pillows! 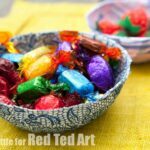 How to… make a Fabric Mâché Bowl! This is one super excellent tutorial!!! And I must add that the models are so darling!!! My Show n Tell is ‘showing off the flowers…”. Do come by if you have time today, I’d love to have you visit with me. Can see you’re loving your wonder web now theres no stopping you! Lovely! Glad you like! And lovely to “meet” you! Too cute. This is a fun and easy idea. Great idea for the apron. I love to recycle whenever I can. I had to come over here & thank you for your kind words over at my blog! I just made one of these today for my sister in law. I didn’t put pockets on her’s though. Yours turned out sooo cute. Oooh, that sounds wonderful! Would LOVE to see a photo!!!? So cute, and the little helpers are adorable! What a fabulous post, my friend! Whew…and after spending this entire week sewing…the “no sew” method of this pretty apron is really…really appealing! Hehe! 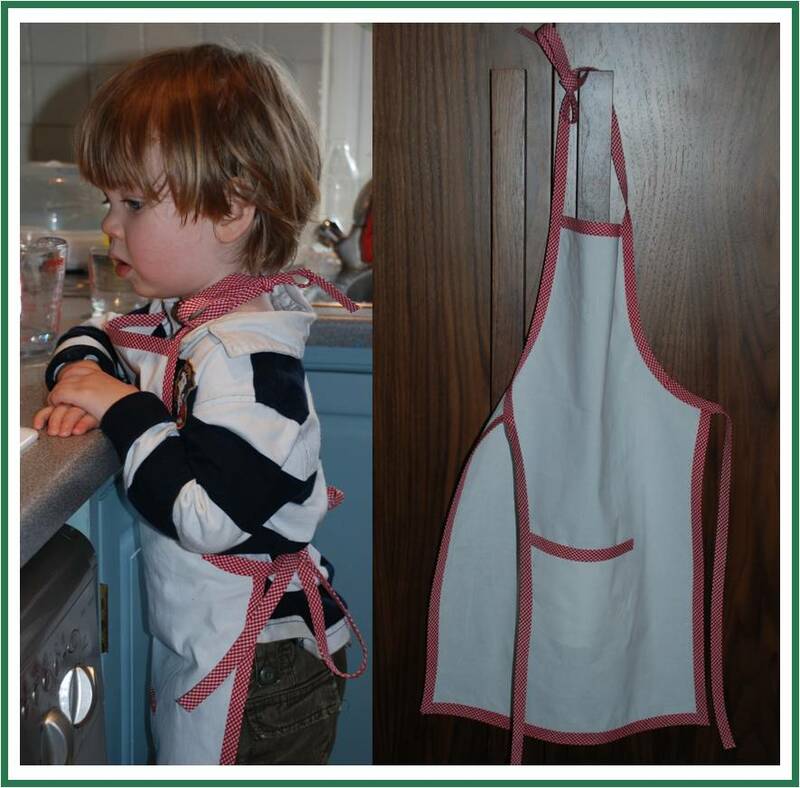 I also love the idea of letting your little one color his apron…what fun!!! Your tutorial was great too! Thank you so much for sharing this great post with us this week for Sunday Favorites! It was such a pleasure having you…sure hope that you’ll join us again!!! So awesome!!! I love that it is no sew! This is very awesome! Thank you so much for sharing. I love aprons! That is way too stinkin’ cute! 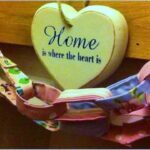 And I love that it doesn’t require sewing! Found this thru All Thingz Related. Brilliant! I love no sew projects! I like give little kid kitchen tools like cookie cutters and our favorite recipie, and a book like the gingerbread man, wrapped up in an apron for birthday parties. It makes a unique gift. OOOh, what a great GIFT idea! Have to confess that I hadn’t thought of that! Fabulous! All my 2-3yr old friends will be getting apron & cookie cutter sets & gingerbread man books (love books too)!! Hurray – sorted for the next 12 mths. Clever clever you! I know you did this post last year, but I just found it and I think I will make a few of these for my grandkids. Great idea! Thank you! Fabulous! So pleased! Have fun making them.